And while she thrives in the digital age, she recognizes that it also poses some problems. Not only do we struggle with consuming all of the information (about 6,000 tweets are tweeted every second), we also have to respond to it (does anyone have an empty inbox?) and determine if the research is accurate. “As communicators we have to learn to cut through the noise,” Sherman said. Because we don’t, we are losing our ability to focus. And the noise, she said, stifles our creativity. Some of us obsess over the like button. 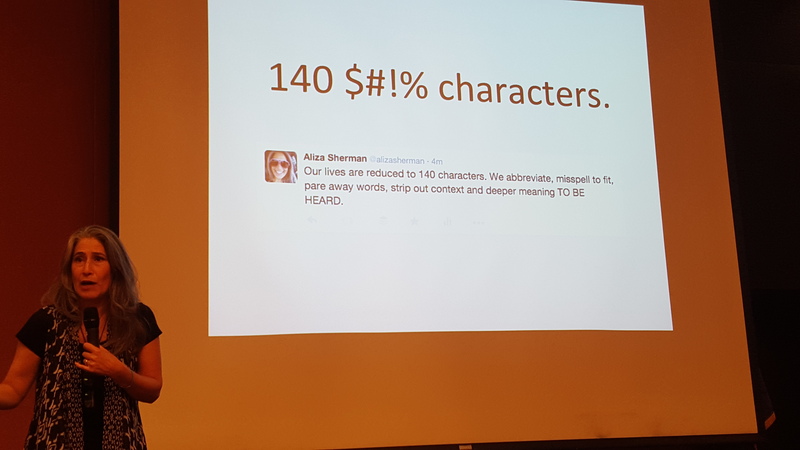 Some limit their communications to 140 characters (myself included @PriceCynthia). “Social media has changed our information consumption habits because it has changed our brains,” Sherman said. The result is that we fight FOMO (Fear of Missing Out) and NoMoPhobia (not having a mobile). Rescue Time tracks time spent on applications and websites, giving you an accurate picture of your day. Coffitivity plays the ambient sounds of a morning coffee shop or the ambient tones of a university café. You can also upgrade to get ambient sounds from Paris or a Brazilian coffeeshop. Humin manages your contacts and helps you sift through the data. Calm allows you to discover the power of meditation and take a mental break. Sometimes, though, the best app is no app.